Hugh Lawson White, ca. 1830 by Ralph E. W. Earl. 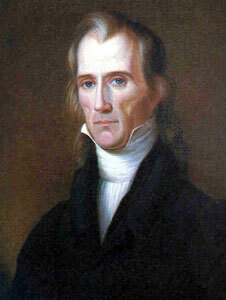 Hugh Lawson White was a U.S. senator whose 1836 presidential candidacy helped to establish the Whig Party both in Tennessee and in the South. The son of General James White, the founder of Knoxville, White briefly served as private secretary to William Blount, governor of the Southwest Territory, before receiving his license to practice law in 1796. The success of his law practice and the prominence of his family led to his appointment or election to several important positions, including judge on the Tennessee Supreme Court of Law and Equity, United States district attorney, judge on the State Supreme Court of Errors and Appeals, state senator representing Knox County, and president of the Bank of Tennessee in Knoxville. White’s service in these offices gained for him a reputation for competence and honesty, and as a known friend of Andrew Jackson he was unanimously elected by the general assembly to succeed Jackson in the U.S. Senate in 1825. Twice the assembly reelected White to the Senate, in 1829 and 1835, and both times the vote for him was again unanimous. Upon his election to the presidency in 1828, Jackson offered White a cabinet appointment as secretary of war. White declined, but served during Jackson’s first term as one of the administration’s most loyal defenders. By the beginning of Jackson’s second term, however, White considered himself alienated from the administration. He openly disagreed with Old Hickory’s increasing demand for conformity to the decisions of the Democratic Party. Moreover, he sympathized with Whig charges that Jackson had exceeded the accepted limits of presidential power, and he apparently believed himself slighted when it became clear that the president wanted Vice-President Martin Van Buren to succeed him in the White House. Despite Jackson’s renewed offer to appoint him as secretary of war, White by 1833 was acting more independently in the Senate by opposing several important administration measures. When approached by southern political leaders who had also become estranged from Jackson, White agreed to challenge Van Buren by standing for the presidency himself. White’s supporters presented him as the candidate most loyal to the original principles upon which Jackson had been elected in 1828. In particular, they charged that Jackson and Van Buren were attempting to “dictate” their will to voters by insisting that they support Van Buren simply because he had been nominated by a Democratic convention. They questioned the legitimacy of the convention since it had been packed with Van Buren delegates rather than attended by representatives of the Democratic people. The charge that Jackson was trying to force his will upon the people complemented the northern Whig Party’s claim that Jackson had abused presidential power and acted like a monarch. In the lower South, supporters also argued that White’s status as a slave owner offered better protection for slave property, although this appeal received relatively little hearing in Tennessee. One of four candidates in the 1836 election, White carried only Tennessee and Georgia and finished third in the electoral college. By capturing 49 percent of the popular vote in the southern states, however, White’s candidacy divided the South’s unity behind Jackson’s Democratic Party. Before the next presidential election, most of White’s supporters had joined together with northern Whigs to transform the party into a national force. After the election, White continued to oppose “executive usurpation” and took an active role in the formation of the Whig Party in Tennessee. In 1837 he testified before a House committee that Jackson had misused executive power and had exercised his influence against White in the presidential contest. When Jackson denied this charge, White issued a public letter to substantiate his claims. A year later, White removed himself from consideration for the presidency and instead endorsed Jackson’s nemesis, Henry Clay. When Democrats won control of Tennessee in the 1839 state elections, the general assembly passed a series of resolutions instructing White and his Senate colleague Ephraim H. Foster to vote for the policies of the Van Buren administration. White and Foster both resigned rather than submit to the resolutions, but the state Whig Party then named them as at-large electors for Whig presidential nominee William Henry Harrison. White accepted this nomination, but before he could campaign actively for Harrison he died of consumption at his home in Knoxville in 1840.